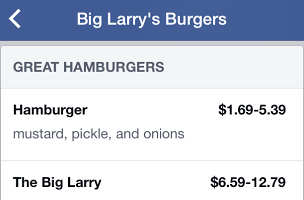 Facebook has added a cool new feature for restaurant-based Facebook pages: menus. Now, thanks to a partnership between Facebook and SinglePlatform (a Constant Contact branch), restaurants with a page can now have their actual menu right there on their timeline for both mobile and desktop. Restaurants who have uploaded their menu through SinglePlatform can easily have their menu accessed from the Facebook page in tab form, so users can get a full sense of the eatery before they go. This helps restaurants put their most important information right on their Facebook pages. You probably already know that Facebook is an excellent tool for engaging loyal customers and spreading the word about business activities. Having a menu easily available on Facebook is convenient for those who regularly interact with your brand there. No longer do they have to open a separate browser window or different app; everything they need is right on the local business Page. SinglePlatform restaurant customers can now insert their menus on their Facebook Page as a new tab right next to their ‘photos’ and ‘likes’ tabs. Any change—from new menu and drink items to weekly specials—can be made directly from their SinglePlatform account, and it will be reflected on their Facebook Page and elsewhere across the SinglePlatform publishing partner network. In the US or Canada, restaurant Pages can now upload menus through SinglePlatform from Constant Contact, an online listings service that helps local businesses connect and engage with consumers by showcasing menus, products and services, photos, specials and more. If you already work with SinglePlatform for your other menu needs, your menu will automatically be added to your restaurant’s Page. If you are outside of the US or Canada, or don’t currently work with SinglePlatform, you can upload a PDF of your menu. On your Page, go to Settings → Page Info → Menus. Readers: If you manage a restaurant page, are you excited about this?